Growing up in Wisconsin during the 1950s and 60s, I was active in the Boy Scouts. 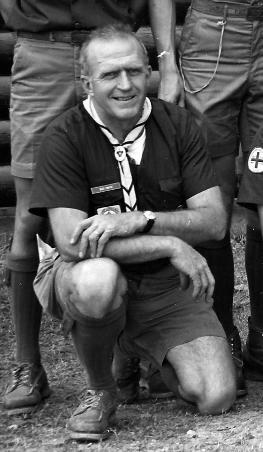 At that time, World War II was still in the not so distant past and many of the Scout dads were veterans. Over the years I encountered dads who had landed on Iwo Jima, flown B-24s over Germany, and slugged it out in the Hurtgen Forest. During my last active years, I worked on the staff at Camp Long Lake, near Fond du Lac, Wisconsin. 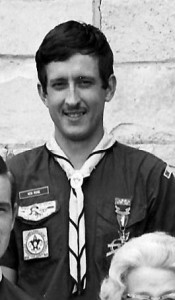 The camp ranger, Bud Smith, had been a glider infantryman in the 17th Airborne Division during World War II. He had fought in the Ardennes and had participated in the cross-Rhine airborne assault at Wesel in March 1945. He was a wonderful man. Those who had the opportunity to work with him learned much about being a good Scout and being a good person. Because I played the trumpet, I served as bugler during the daily flag lowering ceremonies. I also played Taps every Friday night at 10:00 p.m. after the end-of-week campfire as a signal to all Scouts that the evening festivities were over and it was time for quiet. I played Taps from the top of a hill, near the flagpole, so that most of the camp would hear. One night in 1969, as I finished playing Taps and started toward my tent, I was startled by a movement from the shadows of the camp lodge. It was Bud Smith. He approached me and in the dim moonlight I could see that kind of crooked smile that was uniquely his. So I did. I turned and faced another direction so that other parts of the camp might hear and played Taps, just for Bud. When I finished, he was no longer there. I caught a glimpse of him walking down the hill toward the ranger’s house, probably taking with him thoughts of things that he would rather not remember. A few musical notes can have great emotional effect on people. I know that that night, with the playing of Taps, I touched Bud in some way that only music can. He’ gone now. He died too soon some years later while I was serving in Korea. I learned of his death from a mutual friend only after I returned to the U.S. Recently, I was visiting relatives in Wisconsin not far from Bud’s hometown of Oconomowoc. I contacted his daughter. She remembered the night that Taps was played twice”and got directions to the cemetery where he is buried. I took along a Conn OD-painted WWII-era bugle and found Bud’s gravesite. I like to think we had a short chat. Then I played Taps for Bud one last time, one Scout to another, one airborne soldier to another. This time, I was the one doing the blinking and not because the light was too harsh. This entry was posted on Thursday, August 9th, 2018 at 8:00 pm	and is filed under Bugle Stories, General Interest, Getting Started on the Bugle, History of the Bugle. You can follow any responses to this entry through the RSS 2.0 feed. Responses are currently closed, but you can trackback from your own site.